Ms. Visalakshi Sankaran, a passionate part-time teacher, is involved with many things Sanskrit, including but not limited to teaching, translating, and deep dive discussions in literature, grammar and philosophy. Ms. Visalakshi lives in San Jose, CA, teaches Sanskrit to NRIs living in middle east and US. She prepares NRI candidates for Chittoor Sanskrit Exams and under-grad studies over skype. She lectures on various texts such as Neeti Sathakam, Saundarya Lahari, and Bhakti Texts of Adi Sankara to a select set of students in South Bay. 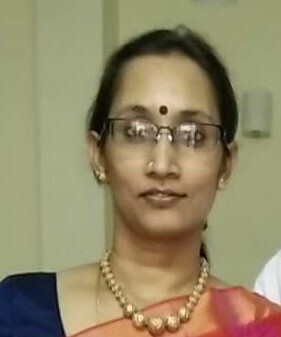 Ms. Visalakshi is also an active blogger (http://samskrute.blogspot.com), and along with her friends has been blogging on Sanskrit literature and Vedanta. In addition she also contributes to online forums such as ambaa-l, and Sanskrit-l. She also composes slokas in her free time. One of her slokas on lord Krishna, was tuned and sung on stage by Sangeetha Kalanidhi Sanjay Subrahmanyam as part of his concert. Ms. Visalakshi was introduced to Samskrita by Smt. Malathi Balasubramaniam, who trained her for the Chittoor board exams. She is a gold medalist from Madras University where she pursued her MA in Sanskrit. She has had additional training in philosophy, Sanskrit grammar and literature from Dr. N. Veezhinathan(Retd. HOD, Dept of Sanskrit, Madras University) and Dr. V. Abhiramasundaram(HOD, Dept. of Sanskrit, Vivekananda College, Chennai). She has widely published in a number of national conferences, including the All India Oriental Conference. Ms. Sankaran setup sanskrit as second language for elementary and middle school students at Chettinad Harishree Vidyalayam, Chennai. She also held lecturer position at Dr MGR Janaki College, Chennai and at RBI Staff Quarters School. Her experience at various places have given her a unique perspective on how Sanskrit should be taught at curricula. Ms. Sankaran was actively involved with CDAC, Pune to digitize Yajur Veda text, and localize free and open-source software in Sanskrit. Her localization work on free open-source software was released as an Indian language pack by CDAC.